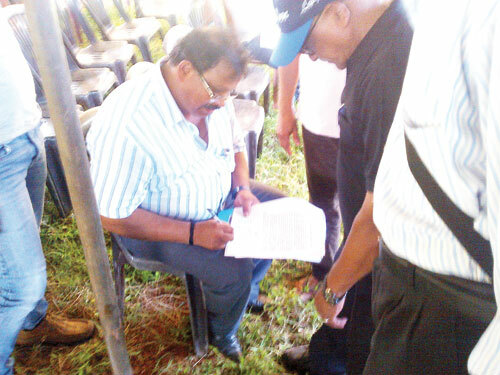 Benaulim MLA Caitu Silva has extended support to the Carmona villagers in their fight against Rahejas and promised to take up their demands with the government. MARGAO: Benaulim MLA Caitu Silva has extended support to the Carmona villagers in their fight against Rahejas and promised to take up their demands with the government. At the village committee’s meeting on Sunday, villagers asked Caitu how he would support them as an MLA. They also demanded that he ask the Director of Panchayats to suspend the Carmona panchayat and that he make the government reject the clearances given to Rahejas. The village committee (VC) recalled that it had met him in May and questioned why he had not followed up the matter. Caitu blamed the panchayat for failing to keep him updated. He assured them that he had always been supporting their agitation against the Rahejas and had even raised the issue in the Assembly. He stated that he was in contact with VC President Blair Rodrigues on the issue and again blamed the panchayat for failing to resolve the villagers’ grievances. Defending his absence at last Sunday’s meeting, Caitu claimed that he had not been invited and that he would have attended the same if he had been informed. Caitu explained that as an MLA, he was not privy to the government’s decisions, such as TCP granting permissions to Rahejas. However, he assured to forward the resolutions to the chief minister and department heads. He also regretted that he could not do much in support of English as the medium of instruction saying that he could only put pressure on the government to fulfil its promise. The villagers also recalled that Caitu was elected as a fresh face in view of the previous government’s flaws and said it was important that he supported them on this critical issue. Caitu reiterated that he would be with the villagers if they decided to hold a morcha to the assembly and that he would submit the villagers’ resolution to the chief minister on Monday itself.